REVIEW: Cannondale Catalyst 4 - Should You Buy? Have you just recently discovered the beauty of mountain biking? However, you are not sure if your newly-found passion will survive the test of time? If you are reluctant to splurge a lot of money on an expensive MTB, but still want to get a good idea of what a MTB can do, you should keep reading. If you want to get a taste of riding the trails and put your adrenaline addiction to the test, then Cannondale Catalyst 4 is just the right choice for you. Cannondale Catalyst 4 is a bike that will give you exactly that. It’s an affordable, entry-level bike that is just perfect for beginners. It has a good base for future upgrades, so if you decide after some time that you have ‘outgrown’ it (technically speaking), you can easily fit it with some more serious components. Let’s take a look at some of the most important parts of this mountain bike. You will get a good deal for the money that you spend on this bike if you decide to buy it. You won’t get much more compared to some other bikes in the same price range, but you won’t get less either. Before anything else, you need to be realistic about this bike. At this price, your expectations should not be too high. However, you shouldn’t keep them too low either since Cannondale is known for building good-quality and durable bicycles. This is what you get with it. 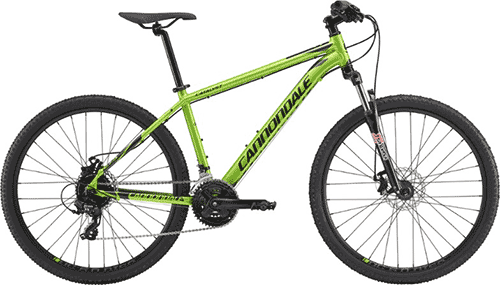 The frame on Cannondale Catalyst 4 is a SmartForm C3 Alloy, 6061 aluminum frame. It is lightweight, durable, and one of the high points on this bicycle. It will definitely survive the beatings that you put the bike through on the trail. Moreover, it is a great base for upgrading the bike in the future, if you decide to go a step forward with the components. The drivetrain offers you a nice range of gears for an entry-level bike and it will be enough for most beginners. However, many cyclists agree that perhaps a 2×10 combo would be a better choice, as the three cogs on the crankset just add unnecessary weight. You probably won’t even use the largest cog if you ride trails most of the time. The derailleurs are one of the weak points on this bike. They are part of Shimano Tourney groupset, which is one of the lowest rankings in the Shimano hierarchy. If you want them to work properly and last for a long time, be careful not to shift gears under too much tension. Otherwise, they will do their job well. The brakes on Cannondale Catalyst 4 are pretty standard mechanical disk brakes, with 160mm rotors on both wheels. Mechanical disk brakes are a bit trickier to adjust than hydraulic and V-brakes. However, they offer a lot more stopping power than V-brakes, especially when riding in wet and muddy conditions. So, even though they are a budget model, you will have good braking support in tough situations. Cannondale Catalyst 3. Quite similar, isn’t it? Some people who bought this bike and rode it report that the tires could be a bit wider. Having a 2.2” or 2.4” tires would better suit the trails and off-road conditions. The rims on this bike are Alex DC 6.0, which is known to be heavy, but it is also quite strong. Since the wheelset contributes a lot to the overall durability of a bicycle, you can rest assured that these can take some beating. The saddle on this MTB is a Cannondale Stage 2. It’s hard to say whether a saddle will fit you well or not, since it’s a personal preference. Some users online reported that this saddle was too narrow and that it didn’t provide enough support for them. However, it’s an individual thing, so for you, it might work out just perfect. If you ever choose to upgrade the bike, the fork should be the first thing to look into. It is a cheap SR Suntour model, powered by a coil spring, without a lockout function. However, there is a preload function, so you will be able to set it up at least partially to your own preference. People who rode it report that it sometimes makes loud noises and feels like a pogo stick. In case you are looking for something else for your MTB, you should take a look at other Cannondale Catalyst models. See the differences below. Cannondale Catalyst 1 (2019) – This is the most expensive of all Cannondale Catalyst models. It comes with a fork with 100mm of travel, and Shimano Acera and Altus components. Cannondale Catalyst 2 – This model is similar to the one above but the difference is the lack of hydraulic lockout feature that Catalyst 1 has. Cannondale Catalyst 3 (2019) – Compared to the Catalyst 4, this model has a preload option on the front suspension and 24 speeds. If you have a nice set of trails in your area or you want to be able to explore the nature around your home, the Cannondale Catalyst 4 is a great choice. However, if your idea of a MTB is to take it to its extremes and test your own limits as well, then this bike is maybe not the best choice for you. Cannondale Catalyst 4 is a great mountain bike for casual rides on trails and gravel roads but will take a limited beating in extreme conditions. If you choose to invest your money in this Cannondale’s model, it will be money well spent. You get a decent frame that will bind all of the components together and a reliable build that Cannondale is famous for. The fork and the derailleurs might give in first under too much load that this bike is not designed for. However, it’s important to note that this is a pretty standard setup in this price range. Cycling enthusiasts sometimes like being too nitpicky and going into excessive detail about their bikes. And this is fine. However, if you are a beginner, the standards do not need to be that high. 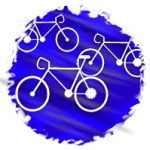 It’s a good, all-around bicycle that you will have a fun time on the trails behind your house or exploring the paths in a local forest.